Nepalese model Varsha Thapa, after A Show, NYC, September 2013. 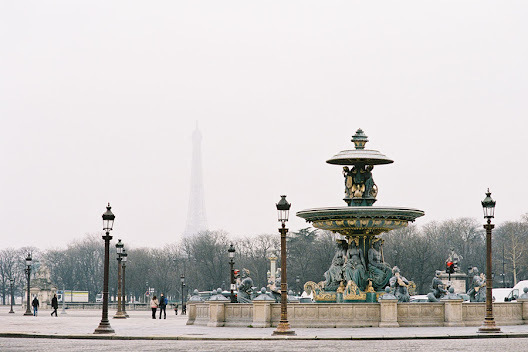 Vika Gazinskaya, (wearing Vika Gazinskaya), Tuileries, Paris, March 2013. Elena Perminova, Tuileries, Paris, March 2013. Those Versace sandals! oh me oh my. South Korean model Sung Hee Kim, after Paco Rabanne, Paris, October 2012. Student and blogger Maria Van Nguyen from Vanilla Scented blog, before A Show, NYC, September 2013. Love this fresh look on Maria...a different way to style boyfriend jeans. I think Maria said that she made the coat she is wearing (she is a fashion design student at Parsons!). After Rodarte, NYC, September 2012. Fashion Editor and Stylist Ekatarina Mukhina (and her little foxy friend by Vika Gazinskaya), before Miu Miu, Paris, March 2013. Anouck Lepere, after Theyskens' Theory (I think! 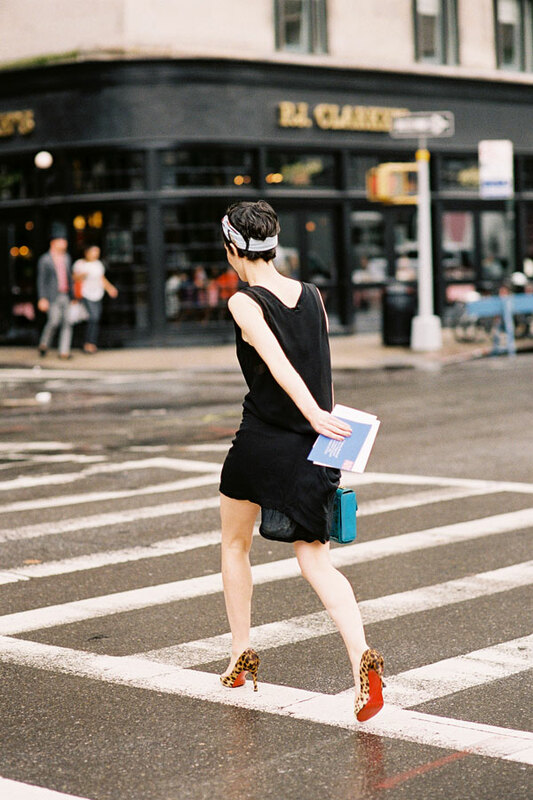 ), NYC,September 2012. Such a lovely summer look on Anouck... love the combination of very sweet, girly blouse with the harder leather shorts. DJ Leigh Lezark, after Giambattista Valli, Paris, March 2013. Estonian model Katlin Aas, after Louis Vuitton, Paris, March 2013. Ukraine model Evelina Mambetova, after A Show, NYC, September 2012. Thanks for the model i.d. @anonymous Stephanie! Velour magazine Fashion Director, Violaine Bernard, after A Show, NYC, September 2013. The adorable Violaine looking oh-so-French-chic on a rainy day in NYC. I love how she has transformed her simple little black tank dress with leopard print pumps, turquoise bag and scarf around her hair. So utterly perfect. Style Director Harper's Bazaar US Joanna Hillman, before Celine, Paris, March 2013. Leopard print + slouchy leather trousers + red lips = another fabulous Joanna combination! p.s. How is Joanna's hair so perfect all the time?! Topshop Animal bomber, Just Cavalli leopard bomber jacket, Stella McCartney leopard-print linen jacket, Alice + Olivia Elbow Patch leopard blazer, PJK Patterson J.Kincaid Ricci leopard blazer or IRO Jeffry bomber jacket (not leopard print but it ticks the animal print + bomber jacket boxes). Buro 24/7's Miroslava Duma, after Rodarte, NYC, September 2012. Ukrainian model Alex Yuryeva, after Jen Kao, NYC, September 2012. Market Editor WSJ Preetma Singh, before A Show, NYC, September 2012. Such a gorgeous dress on Preetma.....from memory I thought she said it was Manish Arora but I could have got that completely mixed up! Weekend hair inspiration via Esther Heesch and Tilda Lindstam after Valentino, Paris, March 2013. Editor of L' Uomo Vogue and Contributing Fashion Editor W magazine, Giovanna Battaglia, after Celine, Paris, March 2013. 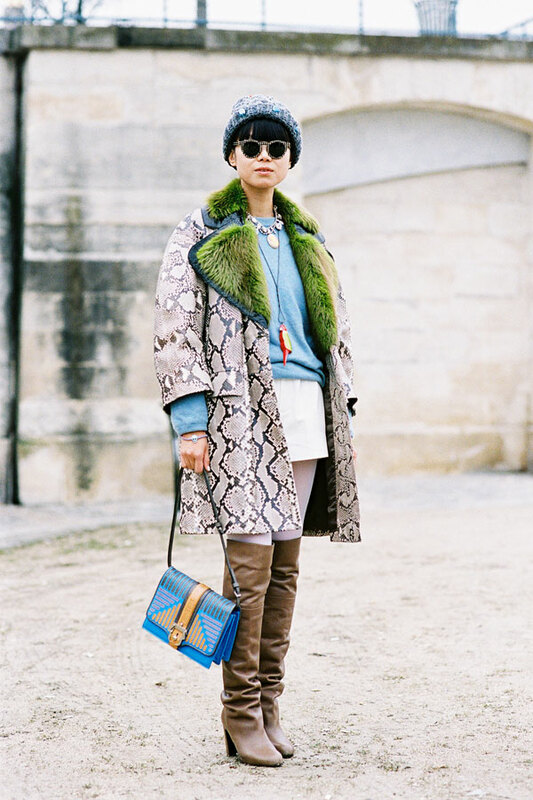 Stylist Tina Leung from Tina Loves blog, before Christian Dior, Paris, March 2013. Teen Vogue's Senior Fashion News Director, Jane Keltner de Valle, before A Show, NYC, September 2012. Place de la Concorde, Paris, late February 2013. 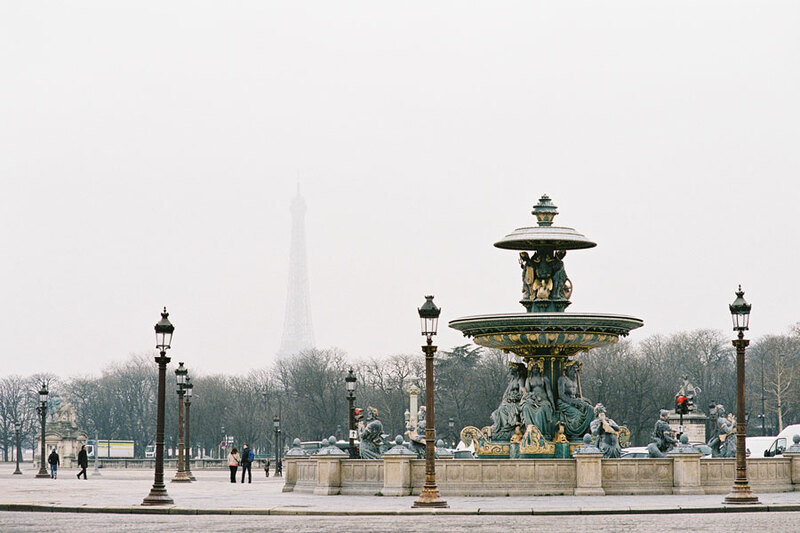 I took this photograph on a very misty afternoon as I was heading to the Tuileries for a show. It is almost a game of "Can you find the Eiffel Tower?" 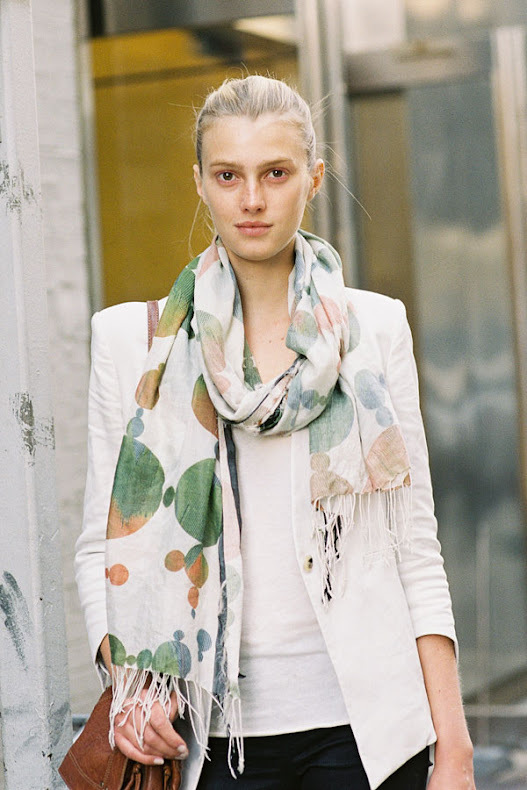 Martinican model Sigrid Agren, after Donna Karan, NYC, September 2013. Today's first three posts are all focused on a wardrobe staple: the white blazer/jacket: Sigrid has teamed her white jacket with super skinny jeans + scarf while Joanna and Lisa have opted for white suiting. Style Director Harper's Bazaar (US), Joanna Hillman, after Rodarte, NYC, September 2012. 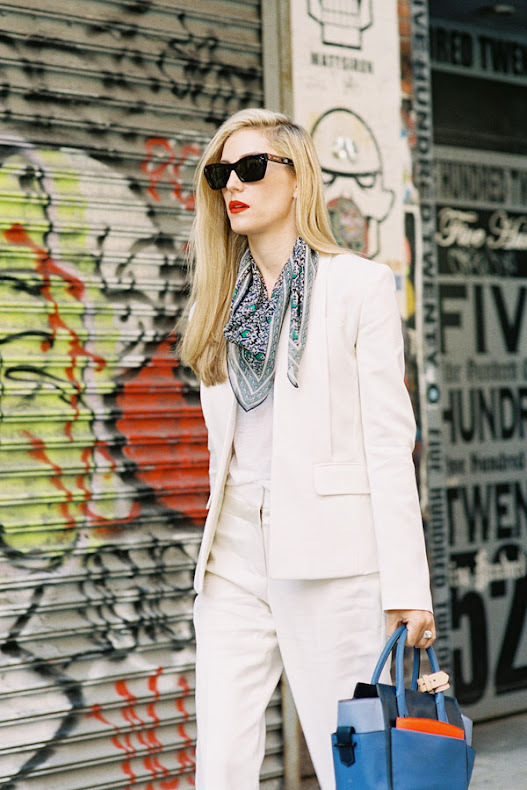 Another beautiful white blazer/jacket + scarf look.....this time accompanied by matching white pants. Love Joanna's signature red lipstick against the stark white suit as well! Swimwear designer and stylist Lisa Marie Fernandez, before Chanel, Paris, March 2013. Go all out in a white trouser suit like Lisa Marie is wearing (note the high-neck skivvy she has on underneath: perfect if you want to wear a white suit in Spring or Autumn/Winter). Senior Fashion Editor Elle China, Leaf Greener, Tuileries, Paris, March 2013. Marie Myrhoj Jensen from Nemesis Babe blog, before A Show, Paris, October 2012. Such a pretty summery look on beautiful Marie!